Shirley Jaffe, an American painter working in Paris whose brilliantly colored, dancing geometric forms found an appreciative new audience when she began exhibiting in New York in the 1990s, died on Thursday in Louveciennes, France, near Versailles. She was 92. Her death was confirmed by her brother, Jerry Sternstein. Ms. Jaffe moved to Paris in 1949 and, somewhat to her own surprise, settled in and stayed. She was surrounded in the early days by a coterie of American artists, including Sam Francis, Joan Mitchell and Al Held, and the Canadian Jean-Paul Riopelle. Her Abstract Expressionist work found a home in the Jean Fournier Gallery. She became a fixture on the scene. But she experienced a crisis in the early 1960s during a year in Berlin. For the next half-century, working in a small apartment-studio on the Left Bank, Ms. Jaffe refined and extended her inquiries into the drama of form and color — always at a distance, literally and figuratively, from the currents of American art. She was born Shirley Sternstein on Oct. 2, 1923, in Elizabeth, N.J. Her father, Benjamin, ran a shirt factory. After his death, when she was 10, the factory failed and her mother, the former Anna Levine, took her three children to the Brighton Beach neighborhood of Brooklyn. After graduating from Abraham Lincoln High School, she earned a certificate in art from the Cooper Union in 1945. She then worked in the print department of the New York Public Library and for a time drew fashion sketches in the advertising department at Macy’s. After marrying Irving Jaffe, she moved to Washington, where Mr. Jaffe was the White House correspondent for Agence France-Presse. She attended the Phillips Art School there before moving with her husband to Paris, where he continued working for the news agency and studied sociology at the Sorbonne on the G.I. Bill. “I went to every contemporary gallery and looked at everybody’s work and gave myself a visual education,” Ms. Jaffe told Bomb. By the time she and her husband divorced in 1962, she had been given her first solo show in Bern, Switzerland, and found a place for herself in Paris’s small art community. In the middle of the decade she began showing regularly at the Fournier Gallery, although Mr. Fournier was less than enthusiastic about the new direction her work had taken late in the decade. 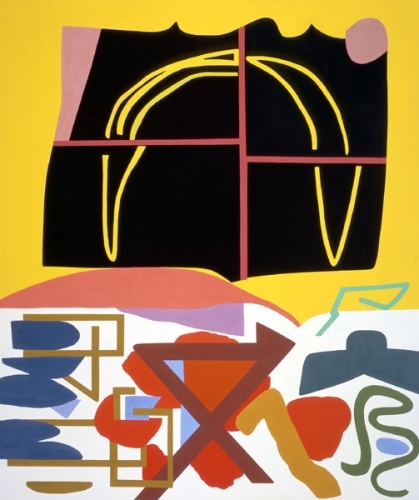 Ms. Jaffe’s fellow Abstract Expressionists regarded her break with gestural abstraction as heresy, and it was not until she was in her 60s that she was given her first solo show in New York, at the Holly Solomon Gallery. Tibor de Nagy Gallery has represented her in the United States since 2002. In France, she is represented by the Galerie Nathalie Obadia. In 1999, the Musée d’Art Moderne de Céret, near the Spanish border, mounted a survey of her paintings of the previous two decades, and the 14th-century chapel of St. John the Evangelist in Perpignan, farther north, installed nine stained-glass windows that she had been commissioned to design. She leaves no immediate survivors aside from her brother. Ms. Jaffe worked steadily and methodically into her 90s, producing paintings and works on paper that showed no sign of flagging invention or vigor. The evidence was on display as recently as March, when Tibor de Nagy exhibited her mixed-media works on paper.